In addition to the controversial redesign of the news feed, and announcements from the f8 conference about the new Timeline profile and app-fueled Graph Rank, was another very interesting Facebook-related development last week. 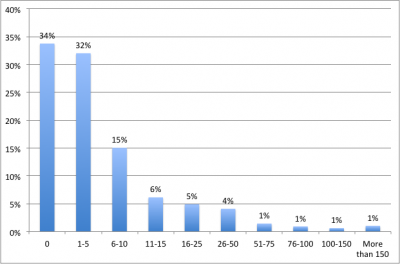 My friends (and client) ExactTarget released part 10 of their social media research series. This one is called “The Meaning of Like” and analyzes the psychology of consumer use of the “like” button. (Note that the study was done before Facebook announced that the “like” button would be multiplying like a pair of rabbits on Red Bull, with new “want” “own” “drink” “watch” and “shopping” buttons being spawned). Although I can see the wisdom (although I use that word in connection with Facebook very loosely) in giving users and companies more specificity in their one-click declarations, #winning with the “like” button alone is pretty damn hard – much less after a severe case of button creep. How hard is it to win the “like” button game? 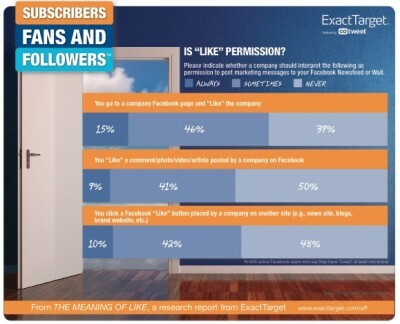 Data in the free “The Meaning of Like” report shows that 32% of users have never liked a company on Facebook, and 23% of those that have liked a company in the past don’t do so any more. How many of those do I currently like on Facebook? Two (and I’ve liked a LOT more than 9.8 company pages in my day). Companies sometimes ask me why they have so few Facebook fans, in comparison to email subscribers and overall customers. If we have 100,000 customers, why don’t we have 100,000 Facebook likes? Firstly, not every customer is on Facebook. Tom Webster from Edison Research says 52% of Americans are on Facebook, and when Tom Webster talks I listen. So that brings your potential like base to 52,000. 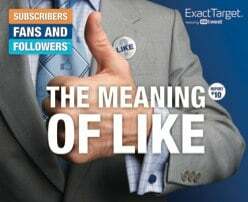 And 32% of users have never liked a company, bringing your theoretical maximum number of Facebook fans to 35,360 (52,000 x 68%). In most cases, companies aren’t fully committed to promoting their Facebook presence at every turn, meaning that some portion of that 35,560 doesn’t even know you’re on Facebook. Perhaps most importantly – as underscored by the 9.8 finding, a bunch of your customers – even satisfied ones – don’t think you’re worthy of a like. Assuming that even your best and most loyal customers will “like” your page is a fallacy, considering you have to battle it out with hundreds of other brands to make it into that “magic 9.8” likes for the average Facebook user. That’s a tall order for every company. Consider: I own two iphones, three ipads, three ipods, and two Mac computers yet I’ve never liked Apple on Facebook. This defies current conventional wisdom, but the prime objective for your Facebook efforts should not really be to grow your like base, especially through aggressive “like” buying and special offers. Shoot for steady expansion, but recognize that you simply will not be in the “magic 9.8” for most people. Instead, you should be redoubling your efforts to activate and encourage the customers who have already liked you. Because while a “like” is just one click, putting you in the “magic 9.8” is pretty special. And don’t abuse that vote of confidence. The report shows that 39% of Facebook users do not interpret their own “likes” of a company to equate to permission for that company to deliver marketing messages to the news feed – potentially bad news for the revamped style of applications Facebook announced that will automatically deliver hyper-targeted info to your feed. I’ve said in the past that the “like” is essentially digital bumper stickering. And now we now just how many stickers will fit on the cars of most Facebook users… 9.8. Our bonds between our Facebook fans and our companies are about to get even more complicated with the announcement that non-fans will now be allowed to post to the Wall, removing one of the rationales for putting you in the magic 9.8 in the first place. Yikes.